So far in 2012, we’ve seen a number of kid-friendly portable devices including the PlayBase Plus, LeapPad 2, Kurio and Meep! (to name a few). Now, the competition is about to get fiercer after the US-based company Vinci, which is apparently specialized in manufacturing learning tablets for toddlers and pre-schoolers, has introduced its latest slate PC, called Tab II M. Reportedly, this one is aimed at kids (18 months – 9 years) and is smaller, and cheaper alternative to the maker’s Vinci Tab II tablet. The Tab II M sports a ruggedized design and is powered by an ARM Cortex-A9 processor that houses one physical core operating at 1.2GHz and the Mali-400 (MHz) video card for accelerating 3D graphics. Furthermore, the educational slate presumably runs on an Android-based operating system and is outfitted with a 5-inch touchscreen display. 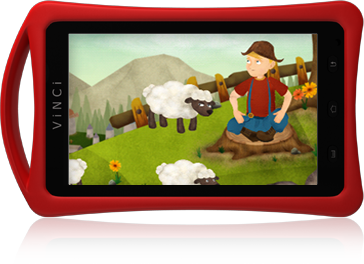 According to Vinci, the tablet offers a Parent Mode, which allows users to utilize the built-in Wireless LAN module to surf the web. 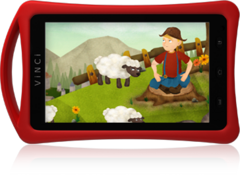 In addition, the Tab II M can be employed to access the Vinci Kids Library, Vinci Curriculum, and comes preloaded with 3 Storybooks, 6 learning apps and Baby Haha's Music Video Adventures. Other features presumably include up to 4 hours of battery life, 8GB internal storage and a free diary “after registering”. The Tab II M will become commercially available sometime this summer, priced at $169.